1919 Feb 10. Undermentioned Cadets to be temp. 2nd Lts. under the provisions of the Royal Warrant dated 30th Dec. 1918, promulgated in Army Order 1 of 1st Jan. 1919 : — Henry Warden Barrett. 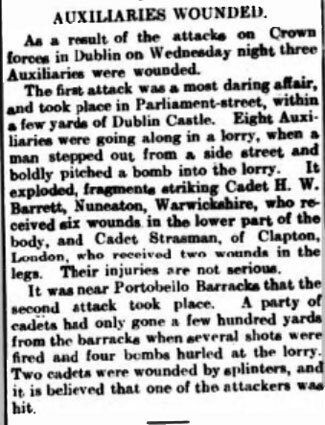 1921 Jan 19 T/C H W Barrett and T/C S E Strasman were wounded in an attack on an Auxiliary tender in Parliament Street, within a few yards of Dublin Castle. 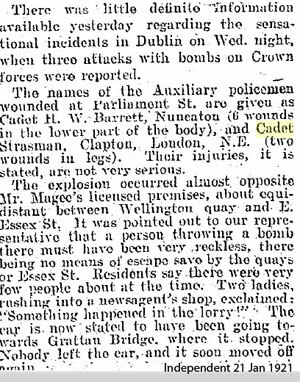 Eight Cadets from "I" Company were in a Crossley Tender, when a man emerged from a side street and threw a bomb into the Tender. Cadet H.W. Barrett, received six wounds in the lower part of the body and Cadet S.E. Strasman received two wounds in his legs. 1926 Sep 8. Leaves UK for Port Harcourt, Nigeria. He is an "assistant"
1929 Apr 3. Leaves UK for Lagos. He is a "clerk"
1931 May 16. Leaves UK for Nigeria. He is a "beachmaster"